With the overall shaping done, the next steps were detail work on the arms, starting with tapering the ends. 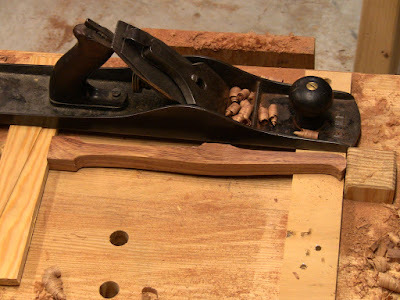 The simplest way to taper a piece is with a plane. Wedged in place with the far end resting on a spacer, take a few strokes off the end, then start backing up further with each stroke. 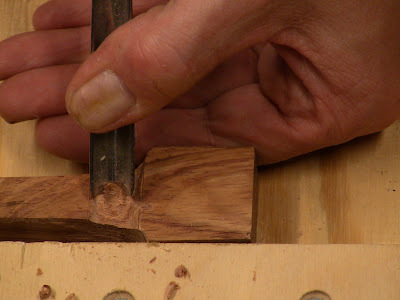 Roughing in the finger recesses with a carving gouge. Enlarging the recesses with a cylindrical Surform rasp. 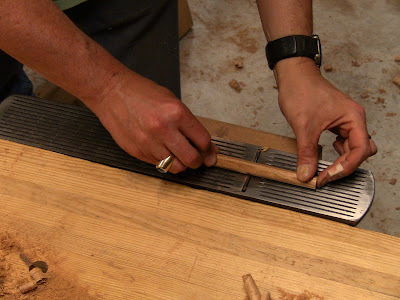 Rounding the ends over with a flat rasp. 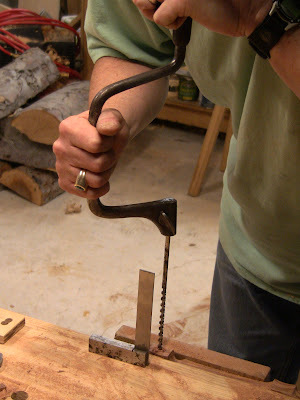 Chamfering the arms with a scraper. It works beautifully to soften the edges. 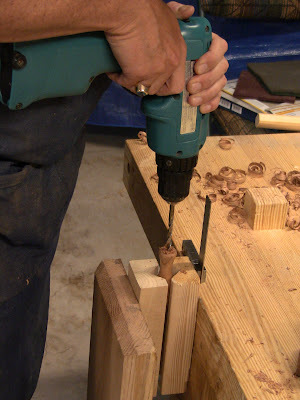 Drilling the hole for the brass blade-holder pin in an arm. This needs to be straight so that the pins are aligned in both arms. The finished arms. You can see where some of the brittle edges have chipped off the tip of the curve. The pins appear to be straight. 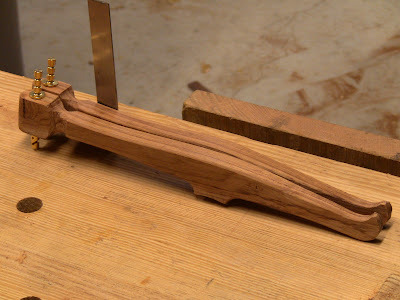 Next I formed the curved loose mortise and tenon joints where the stretcher joins the arms. 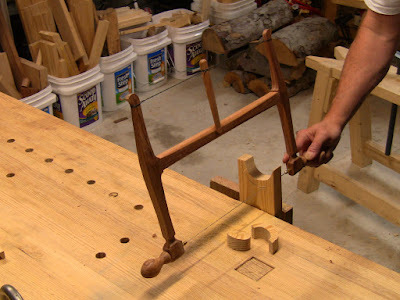 Mortising an arm for the stretcher. 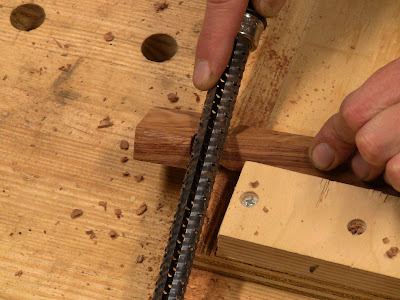 The clamp on the sides prevents splitting out. Chamfering the stretcher. The easiest thing turned out to be simply scraping it down, producing this gossamer aromatic excelsior. 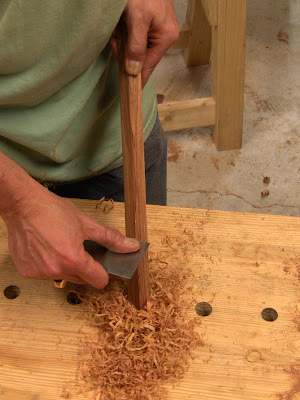 Finishing up the cheek cuts on the tenon. 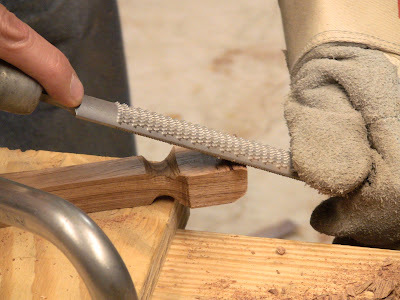 The rounded tenon shoulders had me scratching my head for a bit until I came up with this method for shooting the curved ends with a shoulder plane. The next piece to make was the toggle, starting with a small piece ripped square. I could have turned it on the lathe, but chose to round it by hand. 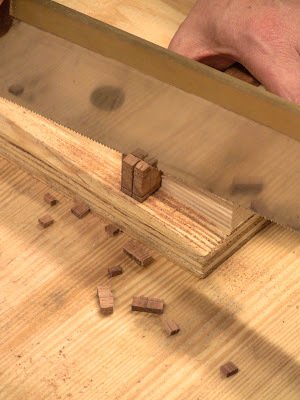 Another option is to use a dowel/peg box, as Harry Strasil showed on Sawmill Creek. 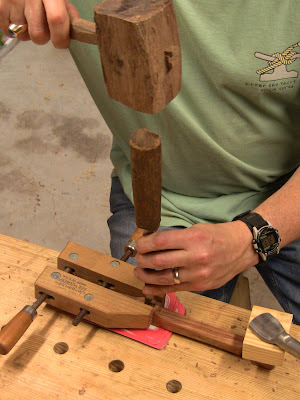 Rounding the toggle on a #6 held upside down in the vise. Also good for removing fingertips. No, the bandaid is from when the tenon saw jumped; I manage to stop it before more than 3 teeth bit. 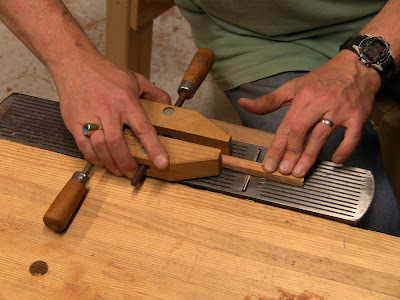 Tapering the flats by pulling back on the clamp while pressing down on the end of the piece. This operation is much safer because you don't have to get your fingers near the plane iron. The final parts were the handles. I glued up a single turning blank long enough for both with Gorilla Glue, since I wasn't sure regular carpenter's glue would work well with the tropical wood. 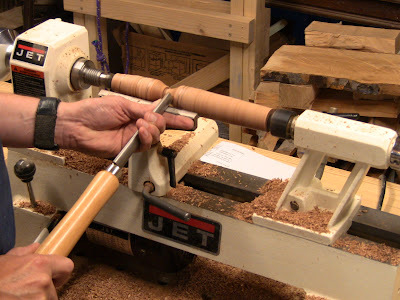 My turning skills are pretty poor, so it's always slow going when I use the lathe. 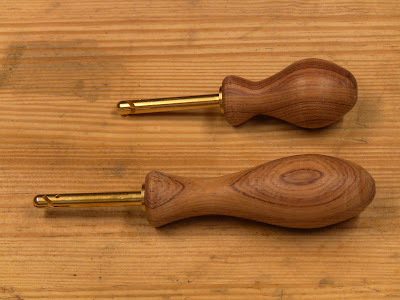 Plus, I'll admit to being a little intimidated by sticking a metal tool into a spinning piece of wood! 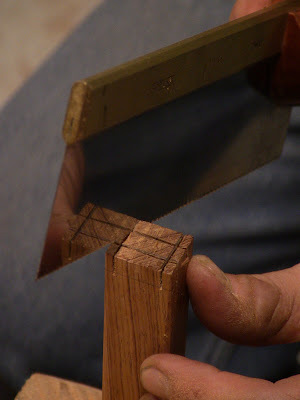 Planing off the corners of the blank. Working down the elongated cove of the main handle. 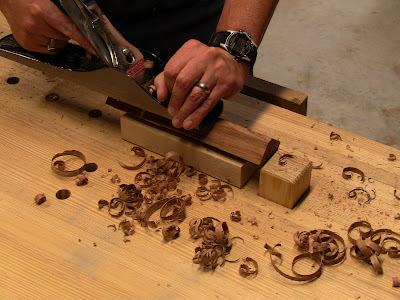 After shaping and sanding, I burnished the turnings by holding handfuls of shavings against them with the lathe running. This produced a silky surface. 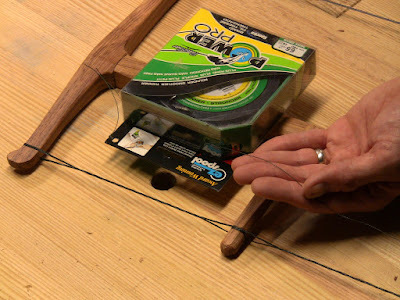 Fully assembled, using four wraps of 65-lb test braided fishing line. Once it started taking tension, the toggle made a rising musical note with each turn as it tapped the stretcher. The pin holes through the handles and arms are sufficiently colinear (no, they're not perfectly aligned!). The one really ugly part is the loose tenons, the fit looks terrible. Here's the line I used. Joel mentioned using braided fishing line, but didn't say what weight. I just bought the heaviest they had at the local hunting and fishing store. This is Spectra fiber, a low-stretch, light-weight, high-strength fiber used in climbing and mountaineering gear and sailboat halyards. 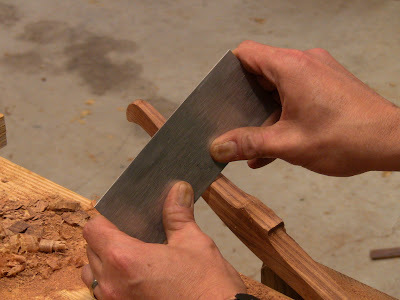 If you wind the toggle too much, the wood or the blade will probably fail before the line does. First test, blade set up for push-cut. The saw cuts smoothly. I'll probably snap a blade or two getting the hang of it, especially learning to fine tune the tension, so I got two sets. I was able to control the curve easily, but I may want to shave a little more weight off the stretcher and smooth the finger recess a bit. And don't forget to release the tension before putting it away! This certainly didn't turn out as a showpiece, but it's a good functional saw, and was an interesting exercise in working with this kind of wood. Really nice build. Well done and thanks for sharing some of your tips. Also noted the sorted scraps in the cat litter buckets, thought I was the only one that did that. Thanks! I should do a blog post just on cat litter buckets in the shop (only half-joking!). They're an underutilized natural resource: storage bins for scrap and parts, trash and shavings bins, totes, stacked as adjustable work supports, risers for the camera tripod... The lids also make a good supply of plastic for shims, spacers, and glue spreaders (dried yellow/white glue flakes right off when you flex them). Thanks! I'm in central Massachusetts. We get up near Nova Scotia when we visit Maine. It's a beautiful area. Search here for "Gramercy holdfast" and you'll see it mentioned several times. It's very effective. 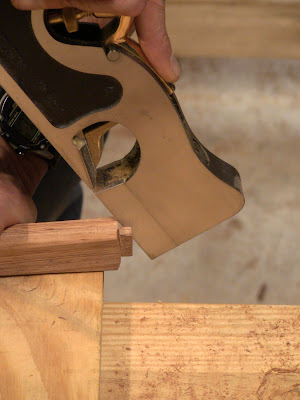 I put holdfast holes in my sawbench and use them occasionally when working on shorter pieces or other times when just holding the board down with my knee gets awkward. 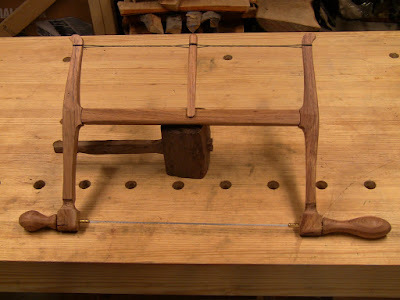 My bench is from Chris' original sawbench plan: http://www.popularwoodworking.com/upload/contents/290/Sawbench.pdf. Mine is 6 1/2" wide, though he calls for 7". Always great info Steve! I was at the Lie Nielson Event yesterday in Brooklyn and got to see the Gramercy Bow saw in action. It certainly perked my interest. In fact I could have used it today, my coping saw wasn't exactly up to the task. I would certainly like to build one in the future and when I do I'll be back here! Thanks, Chris! They really are nice. Does take a bit of practice, but you just saw away from the line far enough to accommodate your current skill level.